These last few months I’ve been working in create a ETL process in PowerShell to replace a DOS batch process that collect a Report Server third-party application log data. During my analysis of how this DOS process works I discover this process was losing data, The log records in contains different type of records making the number of columns varying between 12 to 15. At the same time losing data due to using the SQL Server BCP utility to bulk copy data in a SQL Server data. Here is were the magic of PowerShell brings to the table. This is our chance to be creative. In its basic form, we need to connect to the report server and access their log folder. We do this by creating a network map to the drive which in must cases could be a shared folder. You can use the Cmdlet “New-PSDrive” to define your drive letter mapped to your log folder. Yoiu need to define its parameter -PSProvider as “FileSystem” and you could make it to Persist during your PowerShell session. We created drive letter T: and so now we removed it from you session. So after the drive gets mapped to T: drive, we need to look and collect the type of logs we want to pull. In my scenario, I’m looking for all log labeled “*.Events.*.log.*”. 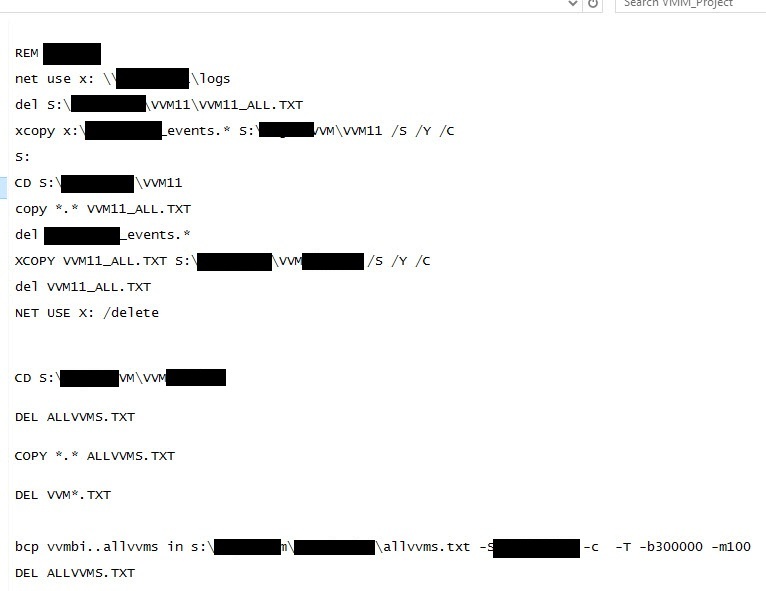 One caveat discovered previously, these text logs file doesn’t contains servername information. But, No Problem! This is another opportunity to be creative with PowerShell. Next step will be to collect all logs from the server by merging all files into one text CSV file. For this step we use the Cmdlet “ForEach” in its script block format and also the Cmdlet “Get-Content” used to append to a CSV final output file using the Cmdlet “Out-File” with the “-Append;” parameter. Now, here’s a comparison between sample DOS batch file previously use vs. the PowerShell basic script. Keep in mind, that you’re building a puzzle. There’s a lot more logic to be added to this code. Next blog I’ll be covering reading, and importing the CSV file to a PowerShell object before reaching its final destination on a SQL server..